Is the mining industry being justly punished, or are investors simply overreacting? Many miners have seen their share prices fall to new lows. Are these miners being justly punished, or is the market simply overreacting? The mining industry moves in cycles, and hyperactive investors can easily overact. Buying the cheapest used car around makes little long-term sense. While you can save a couple thousand dollars upfront, chances are you will have very high maintenance costs that are greater than the initial amount you saved. In a similar fashion, buying Newmont Mining (NYSE:NEM) just because its stock price has fallen 62% in the past two years is a bad idea. The market has punished Newmont Mining for a number of important factors. The miner is heavily exposed to margin compression in the gold market. In the third quarter of 2013, it only produced $105 million of copper against $1.7 billion of gold. Copper is primarily an industrial metal with relativity steady demand, but Newmont produces much more gold than copper. Newmont's gold mining costs are close to the current gold price of around $1,250. In Q3 2013 it was able to decrease its all-in sustaining costs to $993 per ounce, but it still expects full year all-in sustaining costs in the $1,100 to $1,200 range. The next decade holds more challenges. The Indonesian government wants more metal to be smelted within its borders. Newmont doesn't want to spend a large amount of capital on an expensive smelter, and the government has retaliated with progressive tax increases. The end result is that Newmont's future holds both margin and geopolitical challenges. Freeport-McMoRan Copper & Gold (NYSE:FCX) is also embroiled in the Indonesian controversy, but its prospects are much better. Back in 1998 it already built Indonesia's first and only copper smelter. Freeport-McMoRan's mix of mining and oil and gas extraction make it a healthier and more diversified play than Newmont Mining. In Q4 2013 its total consolidated copper production from mines was 54% of its total revenue, but its comparable gold production was only 10% of its total revenue. This is great news for Freeport, as it means that the company isn't too dependent on volatile investor sentiment. Southern Copper's (NYSE:SCCO) focus is on the copper market, and its limited number of mines has helped its stock price. The Mexican government has raised taxes on Southern Copper, but it hasn't escalated into a controversy of Indonesian proportions with massive tax increases. The government's extra levy on precious metals will be close to nothing, and the increased tax on Mexican earnings before interest, taxes, depreciation, and amortization is expected to have a net impact of just $53 million. Southern Copper's local experience and focused asset base help it operate with an EBIT margin of 46.6%. Its concentration in the copper market exposes it to a Chinese slowdown, but it also helps the company to produce very high margins. Its strong margins mean that in the event of a slowdown, Southern Copper would still have a good chance of producing a profit. 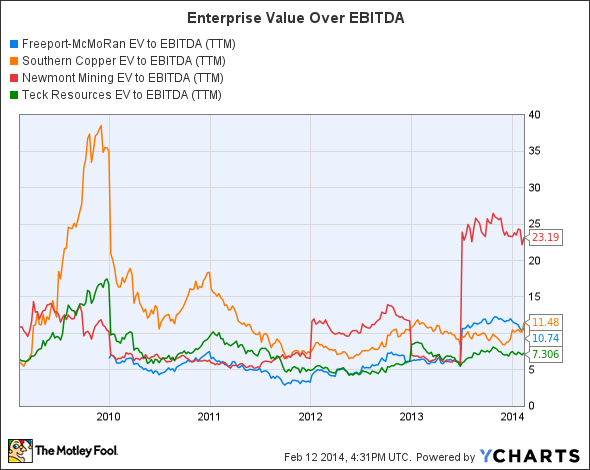 Looking at enterprise value over EBITDA allows you to compare a company's market cap, debt load, and cash to earnings. This method of valuation helps to weed out highly indebted companies that look cheaper than they really are. The chart perfectly explains how Newmont's decreased earnings make it a very expensive miner even though its stock has fallen more than its competitors'. Teck Resources (NYSE:TECK) is the cheapest company based on enterprise value over EBITDA, but it is facing challenges related to its coal operations. Coal and copper are its main markets, respectively comprising 41% and 30% of its revenue in 2013. Australian coal producers are boosting their metallurgical coal output and putting pressure on North American miners. Australia's close proximity to growing markets like China and India gives it a clear advantage. Teck's margin pressures are not expected to end anytime soon, so its valuation discount has merit. At first glance Newmont Mining looks like a steal. Its stock price has fallen for two years, and its price-to-book ratio has dropped to 0.96. If you take a second look and compare the value of the entire enterprise against Newmont's EBITDA, suddenly the company is very expensive. No one metric does everything, and without looking at Newmont's earnings it is impossible to see just how expensive it really is. 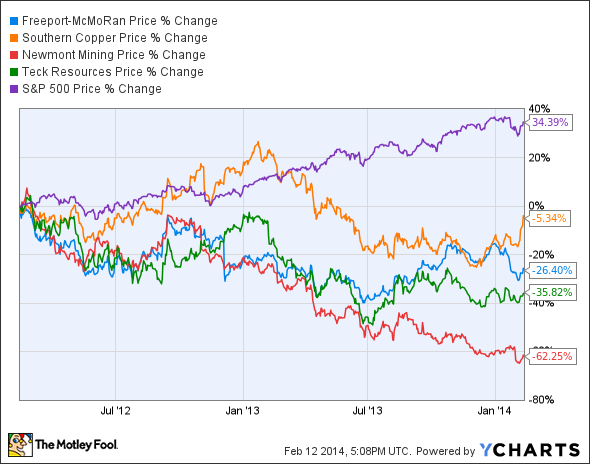 Over the past two years Freeport-McMoRan and Southern Copper have had some of the best performing shares in the industry -- and with good reason. Freeport-McMoRan is a strong miner and oil and gas producer. The company has a well-diversified base of assets, and its valuation is reasonable. Southern Copper is a strong miner with fat margins, but be aware that its focus on copper exposes it to a potential Chinese slowdown.